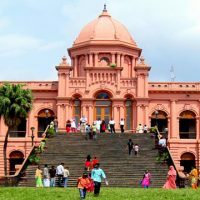 Northbrooke Hall, a graceful building known to people of the area as ‘Lalkuthi’ or red house for its deep red colour, is located at Farashganj, Dhaka on the north bank of the Buriganga River. 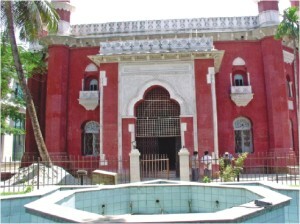 The building was constructed to mark the arrival of Lord Northbrooke, Viceroy of India (1872 1876) visited Dhaka in 1874. The personal band of Nawab Abdul Ghani entertained guests on the day of inauguration. 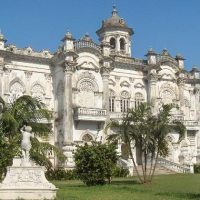 Northbrooke Hall combines elements of Mughal architecture blended with architectural styles of the European Renaissance. The building’s semicircular horseshoe arches contain entrances on the north, the four octagonal minars with pinnacles and the ornamental parapet demonstrate Mughal features. The deep red colour of the grand monument with itsgraded roofs, pinnacles and parapets presents a magnificent view from the riverfront.The town hall was later converted into an auditorium and now offers facilities for social and cultural gatherings. There is now a public library alongside historic building called Johnson Hall and is a major reading centre for the people of old Dhaka. New structures such as assembly halls, community centres and buildings housing a sports club, that have been built on the same premises, now surround it from all sides. Ever since the Mughal times, this riverbank area was a prize location for high class residences. 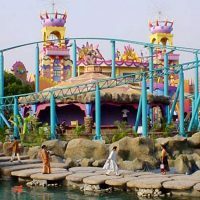 The charm of the riverfront continued up to the beginning of the present century and the most important high class residential areas at the bank of the Buriganga River was for half a mile from North Brook Hall to the Ahsan Manzil. High European civil officers used to live there. Apart from the picturesque waterfront location, this residential area also enjoyed proximity to the main administrative centre at Victoria Park. 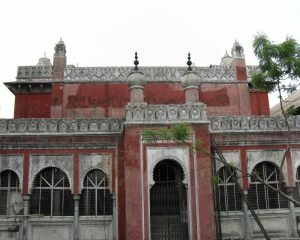 The palace of Dhaka Nawabs (Ahsan Manzil) was also located there. The Northbrook Hall Road, once the thoroughfare of the powerful and the rich, is now dotted with an assemblage of old and new buildings featuring wholesale shops of motor vehicle parts and books.